Amid growing Imperial oppression on Lothal, the rebels are forced to seek out new allies throughout the galaxy and additional resources to sustain their fight against the Empire. With the help of Ahsoka Tano, the crew of the Ghost bands together with a secret rebel cell and ex-soldiers from the Clone Wars to join a fledgling alliance determined to restore peace and freedom to the galaxy. As Ezra continues his journey to become a Jedi under Kanan’s guidance, the threat of the dark side looms large over the fate of the growing rebellion. Darth Vader himself will dispatch new Inquisitors to snuff any spark of resistance, setting the stage for a climactic showdown in which past lives will be revealed, terrible truths will be discovered, and the lives of our heroes will be changed forever. 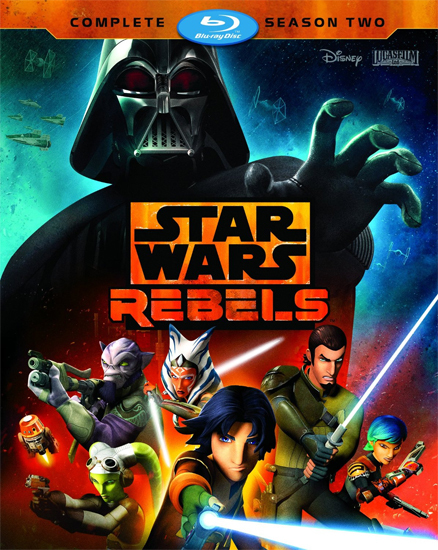 Star Wars Rebels: The Complete Season Two releases on Blu-ray and DVD on August 30, 2016, and we have a copy of the Blu-ray to give away to one lucky winner! You can enter to win anytime between now and midnight Eastern time on the night of Wednesday, September 7, 2016. Check out the form below to see all the ways you can enter.